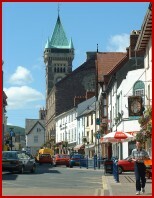 Abergavenny is a holiday destination in its own right, so why not make a weekend of it? There is plenty of choice of accommodation from B&B to four star hotels and both the town and surrounding countryside are a gourmet`s dream. Walking, pony trekking, fishing, golf, even hang/paragliding are all within minutes of the town centre.